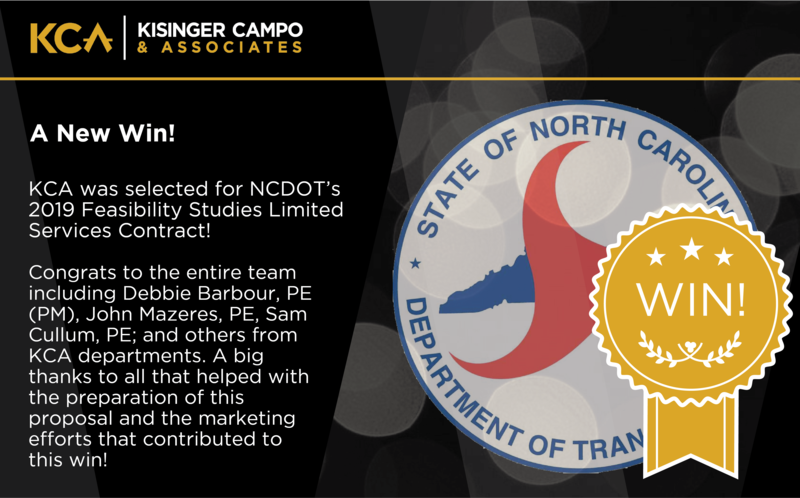 KCA received good news on December 13 after being selected for the 2019 Feasibility Studies Limited Services Contract (LSC) for the North Carolina Department of Transportation (NCDOT). KCA currently holds the 2018 Express Feasibility Studies LSC for NCDOT. A Feasibility Study is the investigation of a candidate Transportation Improvement Program (TIP) project requested by the public, local governments, and/or Board of Transportation Members. KCA was selected as a prime consultant and will be responsible for the evaluation of available information, e.g., traffic demand, environmental / historic concerns, local government concerns and long range transportation plan compatibility, in order to develop project alternates. Once alternates are developed, KCA may be required to prepare cost estimates for right-of-way, utilities, and construction. The findings will then be incorporated into a Feasibility Study Report, which is used by NCDOT upper management to set funding priorities for the biennial update of the TIP. The Feasibility Studies Unit (FSU) is also an integral part of the Project Prioritization Process by validating the cost estimates of candidate projects being considered for prioritization.